1492 - Christopher Columbus visits the island, which he names Hispaniola, or "Little Spain". 1496 - Spaniards set up first Spanish colony in Western hemisphere at Santo Domingo, which subsequently serves as capital of all Spanish colonies in America. 1697 - Treaty of Ryswick gives western part of Hispaniola island (Haiti) to France and eastern part (Santo Domingo - the present Dominican Republic) to Spain. 1795 - Spain cedes its portion of Hispaniola island to France. 1808 - Spain retakes Santo Domingo following revolt by Spanish Creoles. 1821 - Uprising against Spanish rules is followed by brief period of independence. 1822 - Haitian President Jean-Pierre Boyer marches his troops into Santo Domingo and annexes it. 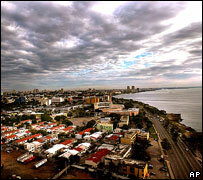 1844 - Boyer overthrown; Santo Domingo declares its independence and becomes the Dominican Republic. 1861-63 - President Pedro Santana returns the Dominican Republic to Spanish rule. 1863-64 - Spain withdraws from, and annuls its annexation of, the Dominican Republic following a popular revolt. 1865 - The second Dominican Republic proclaimed. 1906 - Dominican Republic and US sign 50-year treaty according to which the US takes over the republic's customs department in return for buying its debts. 1916-24 - US forces occupy the Dominican Republic following internal disorder. 1924 - Constitutional government assumes control; US forces withdraw. 1930 - General Rafael Leonidas Trujillo Molina establishes personal dictatorship following the overthrow of President Horacio Vazquez. 1937 - Army massacres 19,000-20,000 Haitians living in areas of the Dominican Republic adjacent to Haiti. 1960 - Organisation of American States adopts resolution calling for severance of diplomatic ties with the Dominican Republic. 1962 - Juan Bosch, founder of the leftist Dominican Revolutionary Party (PRD) elected president in the first democratic elections for nearly four decades. 1963 - Bosch deposed in military coup and replaced by a three-man civilian junta. 1965 - Some 30,000 US troops invade the Dominican Republic following a pro-Bosch uprising. 1966 - Joaquin Balaguer, a Trujillo protege and former leader of the Reformist Party (later to become the centre-right Christian Social Reform Party (PRSC)), is elected president. 1978 - Silvestre Antonio Guzman (PRD) is elected president and proceeds to release some 200 political prisoners, ease media censorship and purge the armed forces of Balaguer supporters. 1979 - Two hurricanes leave more than 200,0000 people homeless and cause damage worth 1 billion dollars as the economy continues to deteriorate due to high fuel prices and low sugar prices. 1982 - Another PRD candidate, Jorge Blanco, elected president. 1985 - IMF-prescribed austerity measures, including price rises for basic foods and petrol, lead to widespread riots. 1986 - Balaguer (PRSC) re-elected president. 1988 - Jorge Blanco tried in absentia and found guilty of corruption during his presidential tenure. 1990 - Balaguer re-elected, defeating Bosch by a small majority. 1994 - Balaguer re-elected, but agrees to serve only a two-year term after being accused of fraud. 1996 - Leonel Fernandez Reyna of the Dominican Liberation Party (PLD) elected president. 1998 - Hurricane George causes widespread devastation. 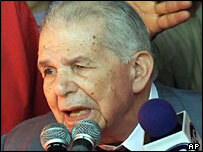 2000 - PRD returned to power with Hipolito Mejia as president. 2001 May - Appeals court quashes a conviction against former president, Salvador Jorge Blanco, on charges of corruption. 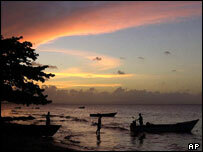 2001 November - US jet bound for Santo Domingo crashes in New York killing all 255 people on board. Three days of national mourning declared. 2002 July - Former president Joaquin Balaguer dies aged 95; thousands pay their last respects to a man who dominated politics for more than 50 years. 2003 November - Deadly clashes between police and protesters during demonstrations against high prices, power cuts. Two months later, demonstrations about economic policies leave at least five dead. 2004 May - Former president Leonel Fernandez defeats incumbent Hipolito Mejia. 2005 September - Congress approves a proposed free trade agreement with the US and Central American nations. The DR enters the accord in March 2007. 2008 May - President Leonel Fernandez is re-elected. 2010 May - Congressional elections. Governing Dominican Liberation Party (PLD) retains firm grip on power. 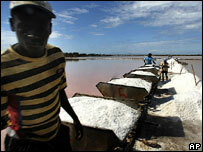 2010 October - Dominican Republic tightens border restrictions to prevent cholera spreading from Haiti. 2012 May - Governing Dominican Liberation Party candidate Danilo Medina wins close presidential election over former president Hipolito Mejia.